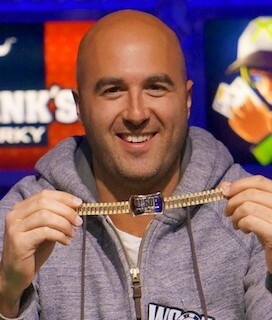 The 2013 WSOP crowned the second Four-Max champion on Sunday. Day 3 returned eight players and after a double elimination a final table of three players was set. Justin Oliverwon the final hand, claimed his first WSOP bracelet and took home $309,071. The final five players relocated to the ESPN Feature Table with Nick Schwarmann holding the chip lead. He opened to 32,000, David Pham called on the button and John Juanda called from the big blind. The flop fell Q 4 2 , Juanda checked, Schwarmann bet 43,000 and Pham called. Juanda though for a moment and then moved all in, Nick Schwarmann snap-called and Pham called – having Juanda covered. Schwarmann tabled A 7 for a flush draw, Pham tabled K J for a smaller flush draw and Juanda flopped two pair holding Q 2 . The board completed 5 3 and Schwarmann took the pot with the nut flush and eliminated Juanda in fifth place and Pham in fourth. About 30 minutes passed before Jared Jaffe got involved in a brutal hand with Schwarmann. Both players committed 35,000 preflop and the board rolled out Q 7 6 . Jaffe checked, Schwarmann bet and Jaffe check-raised to 90,000. Schwarmann moved all in, Jaffe sat back in his chair, stared at Schwarmann and called with Q J . Schwarmann tabled T 5 and watched the board run his way when it completed Q 9 to complete Schwarmann’s flush. Heads-up play began with Schwarmann holding a big chip lead over Justin Oliver – about thee million to 1.1 million. Schwarmann chipped away at Oliver’s stack until he was at 456,000 and made a stand. Oliver moved all in preflop and Schwarmann called with K Q and Oliver tabled A T . The board ran 4 3 3 4 K and Oliver doubled up. Oliver took the chip lead from Schwarmann after he moved all in on the turn with a board of 8 6 2 3 . Schwarmann tank-called holding A 6 and needed to another diamond on the river to best Oliver’s T 8 flush. The river came T and Oliver stacked up 2.5 million to Schwarmann’s 1.1 million. Schwarmann chipped his way back up to the lead but lost it in one fail swoop when he opened for 100,000 and Oliver re-raised to 300,000. Schwarmann moved all in, Oliver snap-called with pocket queens and Schwarmann tabled A Q . The board ran T 5 4 7 5 and Oliver retook the chip lead with 2.5 million. The final hand saw Schwarmann open to 100,000 and Oliver made it 350,000 to play. Schwarmann called, the flop fell 9 8 5 and both players checked. The turn came K , both players checked to the river and it fell 6 . Schwarmann announced all in and Oliver called quickly with K 4 . Schwarmann showed J [Tx] for a missed draw and was eliminated in second place.